After the super hit success of Kanna Laddu Thinna Aasaiya, many people have been waiting to see Santhanam playing the lead again. Now, we have information that Santhanam and his KLTA team will be coming together again in a new movie titled Vaaliba Raja, under debutant director Sai Gokul Ramnath, a former assistant of KV Anand. Santhanam playing the titular role will be joined by Sethu and Vishaka Singh and another female lead will be B-town's Nushrath. 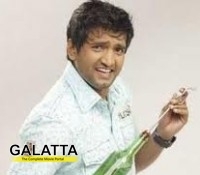 The movie will have Santhanam as a psychiatrist, Sethu as a designer and Vishaka as a Psychiatry student. Touted to be a full-on family entertainer, over 50% of the movie has been shot in 26 days. The remaining portions of the movie are to be shot in Madurai and Kuttralam. Rathan is in charge of music. Vaaliba Raja is being made under the Wangs Vision One banner. >>Ulaganayagan Kamal launches Vaaliba Raja's audio! >>Kanna Laddu Thinna Aasaiya team is back! >>Vishakha in Ajith-Siruthai Siva film?